Internet Brands November 28, 2018 Comment Now! The stakes are high; the car in question will become the first—but certainly not the last—battery-electric Audi Sport model. It follows the e-tron battery-electric crossover utility that arrives next summer, and the e-tron SportBack derivative that follows shortly after. 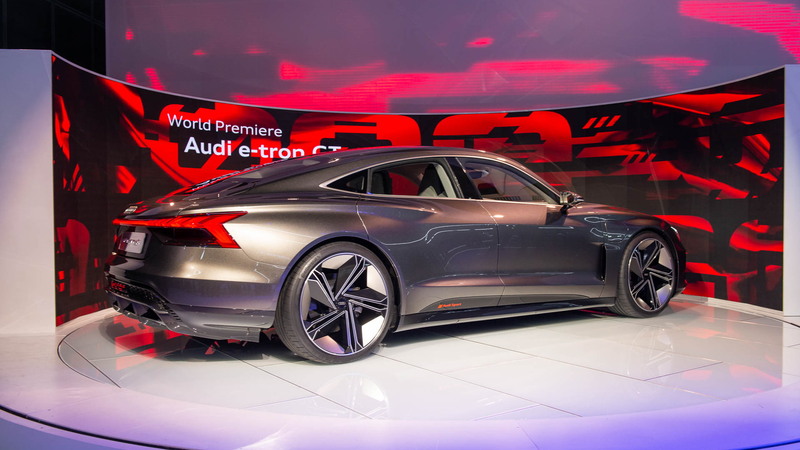 The e-tron GT is labeled as a concept car as it basks in front of the crowd at the 2018 LA Auto Show. It’s much more realistic than some of the dauntingly experimental machines we’re used to seeing, though. How many concepts come equipped with mounting points for a standard-issue roof rack? They’re there because Audi has already started building pre-production prototypes, and the concept’s body-in-white is identical to the production car’s. Clearly, this is far from a self-aggrandizing exercise in cutting-edge design. The powertrain is even closer to series production than the sheet metal. The e-tron GT shares its underpinnings with the upcoming Porsche Taycan, that brand’s first-ever all-electric car. The specifications sheet lists a 96-kwh lithium-ion battery pack and an electric motor for each axle. 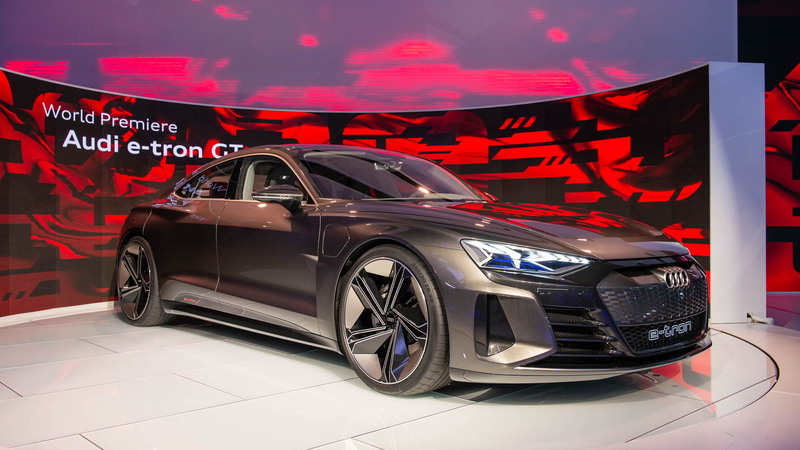 With 590 horsepower on tap and all-wheel drive, Audi says the e-tron GT takes 3.5 seconds to reach 62 mph from a stop and 12 seconds for a zero-to-124-mph sprint. Range checks in at about 250 miles on the European WLTP testing cycle, though it’s likely to be somewhat lower on the EPA test routines used for North America. An 800-volt charging system developed by Porsche provides a recharge up to 80 percent of full capacity in under 20 minutes. By definition, a GT car is one that’s capable of traveling from A to B comfortably and quickly, even if 750 miles separate the two points or if the trip involves an impromptu detour to points E and F. The fast charging will make that a reality. Charging stations equipped with the liquid-cooling charging cables and hardware capable of delivering 350 kilowatts are now under construction both in Europe and North America, and dozens will be available for Taycan owners when that car arrives in 2020. The average motorist won’t notice the similarities between the Taycan and the e-tron GT. Everything the passengers see, touch, or otherwise experience will be Audi-specific. “We are in two different corners,” Lichte said thoughtfully. 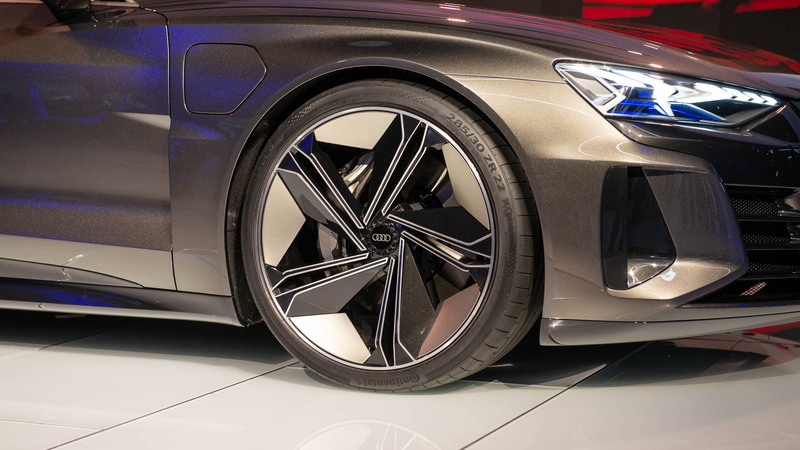 “Because we are one group, during the design process we’re able to compare notes every few months to ensure that no detail is similar.” The air suspension will be tuned in-house by Audi Sport, too, to guarantee the two cars don’t deliver the same driving experience. 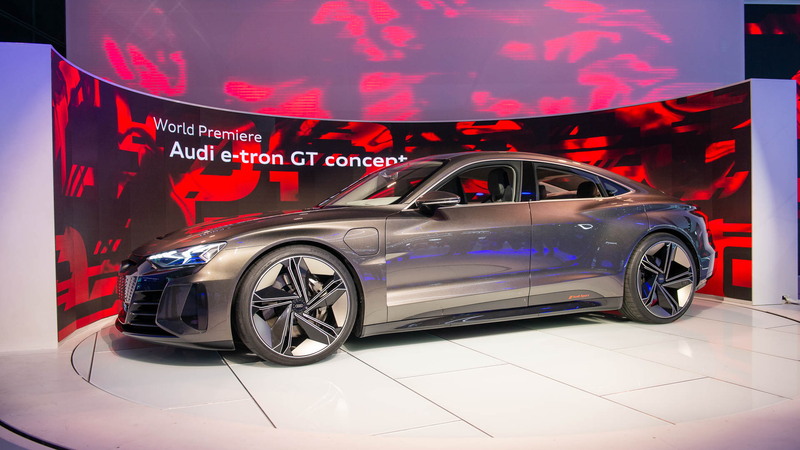 Andreas Mindt, Audi’s head of exterior design, pointed out it was important to make the e-tron GT as aerodynamic as possible for two main reasons. First, streamlining the sheet metal unlocks more driving range, and every mile counts. Second, going electric creates a nearly silent ride that makes the GT’s cabin more susceptible to wind noise. Carefully honing every exterior detail muffles it. The result is a clean, wind-cheating silhouette, a pugnacious stance, and a look that falls in line with recent additions to the Audi family but doesn’t ape the lines of an existing model. Audi’s stylists intentionally added a touch of familiarity to the interior, as they did for the e-tron SUV that precedes this sleek GT model. “As we started designing the interior, we had one idea in mind: An electric R8 for four people,” noted Enzo Rothfuss, Audi’s head of interior design. The familiar elements include the digital instrument cluster (called Virtual Cockpit in Audi-speak) and the infotainment system, a single-screen version of the dual-screen technology found in the Q8 and e-tron crossover, among other models. The GT brings new ideas to the table, too. The upholstery is 100% vegan, for example. The seats are wrapped with a type of cloth woven from recycled fibers, and the floor mats are made from discarded fishing nets trawled out of the ocean. The steering wheel is almost rectangular. It’s a design that gives the driver a better view of the full-color head-up display. Rothfuss said to expect both of these features on the production model, though buyers will still have the option of selecting traditional leather. At least two of the GT’s features won’t make the transition from the show floor to the showroom floor. The first one is the light-up e-tron emblem visible on both ends of the concept. It falls in line with Audi’s push to create a distinctive lighting signature, and it’s pretty cool, but it’s also illegal in certain countries. “In Germany, it’s considered advertising, and advertising is not allowed as a lighting element,” Mindt told Motor Authority. Audi can integrate light-up emblems into a coming home/leaving home function but they have to be turned off when the car is moving. The second concept-only feature is the touch-sensitive door opening sensors on the pillars. The production model will come with regular door handles for safety and convenience reasons. 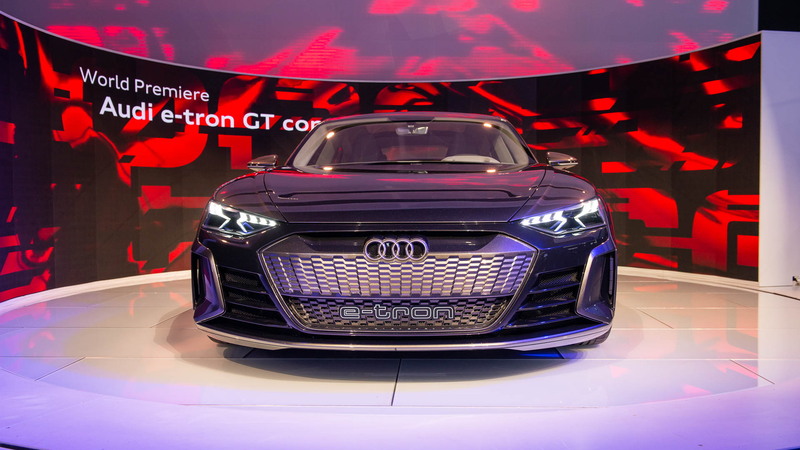 Audi Sport will unveil the production version of the e-tron GT concept in late 2020, and the first customer deliveries are tentatively scheduled for early 2021. While it’s built on Porsche bones, the e-tron GT is different enough from the Taycan to warrant its own production facility. Assembly will take place in the same Neckarsulm, Germany, facility that manufactures the V-10-powered R8. Don’t get the wrong idea; Audi Sport spokesman Stefan Holischka rapidly pointed out the GT won’t replace the R8. “There is enough capacity for both cars. There was the misunderstanding that this car is going to replace the R8; no, it is not,” he affirmed. In the meantime, we’ll wait to see that production car and hope Lichte is right that it will look as good as the concept.